Let us help pinpoint a suitable fix, figuring out the best solution for you and your wallet. Bring in your computers today. No purchase necessary. We Repair Computers, Mac's, Cell Phones & Tablets. We also custom build computers, deploying them to fit your needs & provide a number of different products & services. Over the Internet, our technicians can safely and conveniently service your computer as long as it's online. Set up an appointment today! Affordable rates, plenty of storage, unlimited incoming bandwidth, and tech support you can count on. Call for a free web design consultation. 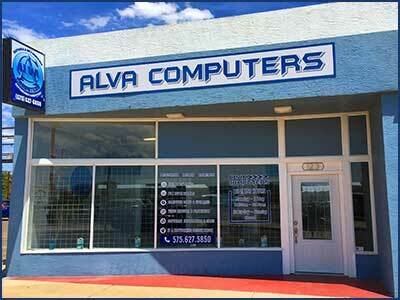 Alva Computers,LLC has been serving the community of Roswell, New Mexico and surrounding areas for over 16+ years. From humble beginnings, We continue to give back to the community with consistent, quality care for all of their technological needs. Custom Built Computers, Computer Parts, Refurbished Computers, Networking & Video Surveillance. Aside from experience, We also have several different qualifications under our belt. Alva Computers is a proud member of the Better Business Bureau. We are partnered with NVIDIA, ASUS, MSI and also a Microsoft Certified Professional. Know that we are always focusing on providing the best support available. Remotely, On-site, or here at our shop, you can trust you're in good hands. In shop diagnosis is always free. Supplying all major brands, from Intel to Asus. Stocked with the latest hardware, we can also install and set-up surveillance systems or networking systems for home and businesses new or old. Contact us for more details. Motherboard upgrade, screen replacement to charger port repair, our experienced staff can install, upgrade, replace, or fix all of your tech devices. At Alva Computers, We remain committed to providing consistent, quality service to all customers, new and old. We strive to bring forward and maintain our place as your one stop shop for all your computer needs.